Shifting attitudes around drug use are changing the way universities address the opioid crisis. In response to the opioid crisis, many universities across the country are stocking and distributing the opioid-blocking medication naloxone. Use of the medication not only saves lives but also signals a shift from the “zero tolerance” approach to drug use towards an approach that prioritizes harm reduction and emphasizes support, education and prevention. Petra Schulz is an instructor in the community health and community studies department at MacEwan University and co-founder of the grassroots organization Moms Stop the Harm. 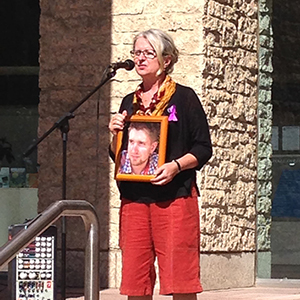 In 2014, Ms. Schulz lost her youngest son Danny to an accidental fentanyl overdose. Danny was in recovery at the time, but the support and treatment groups he and his family attended preached “tough love,” she says. No one told them about keeping naloxone on hand or the potential risks of relapse. Petra Schulz, holding a photo of her son. Photo courtesy of Petra Schulz. “It’s very traumatizing to know the death of your child was so preventable and that there are tools available that you could have known about but didn’t,” Ms. Schulz says. Since forming the organization with a handful of other mothers who lost children to drug-related deaths, Moms Stop the Harm has grown to 400 members, all advocating for better education and drug policy reforms at the federal level. Now Ms. Schulz brings her advocacy to MacEwan, telling her story to nursing classes, and co-organizing events like opioid panel discussions and naloxone training, all to better educate students, staff and faculty in ways that she and her son were not. “There was the old messaging around drugs and the war on drugs. Now we’ve got to talk about safe use of drugs and make people aware that drugs other than marijuana have a higher level of danger attached to them now,” says Paul Dagg, a clinical professor of neuropsychology at the University of British Columbia and program medical director for the mental health and substance use program for B.C.’s Interior Health Authority. Universities, says Dr. Dagg, must think beyond giving people educational competencies and skills, to their role in promoting wellness. Christine Adam, dean of students at Thompson Rivers University, agrees, saying universities need to ensure that “they are healthy internally and that they are supportive of efforts in the community.” She says TRU started having more rigorous conversations around safe drug use after several members of the Kamloops community died from accidental overdoses. In the fall of 2017, the university’s wellness centre became a distribution site for naloxone and has since distributed close to 200 kits. Making the kits a regular part of campus life works to reduce the stigma around drug use, an idea reinforced throughout the TRU campus through the use of an emblem posted at various offices, identifying them as a safe space to have conversations about substance use. Reducing stigma is a key factor in preventing individuals from feeling that they have to use alone, says Dr. Dagg, which is one of the driving factors behind the rise in opioid-related deaths. The University of British Columbia Okanagan chapter of Canadian Students for Sensible Drug Policy, a nationwide student-led organization, is advocating for their university administration to institute a “good Samaritan” policy, which would allow students connected to a drug-related emergency to call for help without the fear of suspension or expulsion. Despite the reservations from their administration, the UBCO chapter has successfully advocated for making naloxone more accessible to the university population through peer-to-peer workshops, and has organized drug-testing seminars, where attendees are taught how to test small samples of a given drug for impurities using a chemical reagent. Michelle Thiessen. Photo courtesy of UBC. 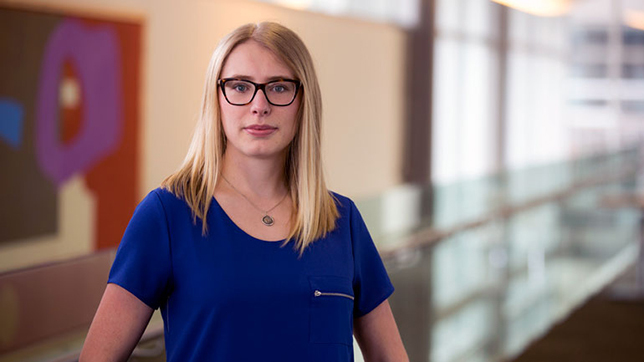 More recently, Ms. Thiessen, a master’s student in clinical psychology at UBCO, advocated for extending the student health coverage to medical cannabis in a new pilot project that’s set to start this fall, with $20,000 being set aside for coverage. The project will be overseen by Zach Walsh, an assistant professor of psychology and cannabis researcher at UBCO. “We’re all paying into the student health plan,” Ms. Thiessen says. “Not having [cannabis] covered incentivizes people to use drugs that are more hazardous.” UBCO is reportedly only the second campus in Canada to undertake such a project, after the University of Waterloo in 2015. “Some people are going to choose to use drugs, and we need to treat those people with respect and dignity and equip them with the necessary education and tools to be able to do so in the safest possible way,” Ms. Thiessen says. Not having Cannabis on the student health plan incentivizes people to use harder drugs? What? So I guess we’ve gone full circle and now Cannabis is a gateway drug?